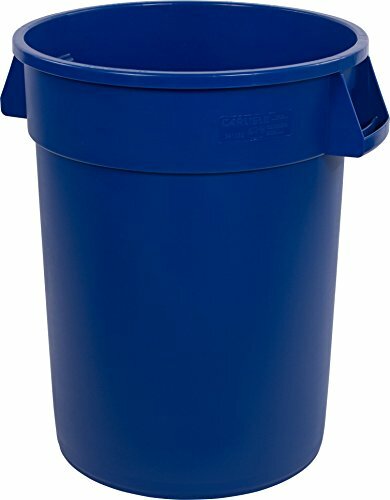 Carlisle Bronco 32 gallon polyethylene waste container has heavy duty construction with double reinforced stress ribs. Ergonomic Comfort Curve handles provide easy handling even when full. BPA free. Drag skids for ultimate durability. Deep hand holds on base for safe controlled tipping or overhead lifting. NSF Std. 2 for food contact and cleanability. Made in USA. NSF listed. 18-inches bottom diameter. 22.38-inches top diameter. 25-1/2-inches diameter with handles.